CNN once again have gone ahead and published a Buzzfeed sourced story that even CNN admits they haven’t corroborated. It’s worth noting for those who aren’t aware, a lot of people don’t click articles and merely just read the titles. So when someone see’s the title “BuzzFeed: Sources say Trump directed Michael Cohen to lie to Congress about proposed Moscow project”, It sounds really bad. But if you actually read the story, it’s sourced from “two federal law enforcement officials involved in an investigation of the matter told BuzzFeed.” As well as “documents,” But we’ll get to that in a minute. Not reliable and conveniently cannot be confirmed. Nonetheless, CNN went ahead and published the story as if it’s 100% true and as if Buzzfeed can be trusted. The story says that President Trump personally directed attorney Michael Cohen to lie to Congress about the Moscow Trump Tower project. Buzzfeed and CNN reports that Mueller’s office apparently learned Trump directed Cohen to lie to Congress through interviews with multiple witnesses from the Trump Organization, internal company emails, text messages and other documents. So wait, Mueller has a leakage problem? He’s got law enforcement officials leaking his intel? Or all of this is just another nothing made up burger. Do we just forget that Trump’s team had already sent Special Counsel Robert Mueller the info and Docs on the Moscow Trump Tower project that never went ahead?. Pretty strange that Trump would tell Cohen to lie after he’d already told Mueller about the project. What’s the count on mainstream media bombshells that go nowhere up to?. When Buzzfeed contacted Cohen he declined to respond, as did the Special Counsel. So none of this has been confirmed and could be just made up, just like the Steele Dossier and countless other “bombshells”. In the initial Buzzfeed report one of the reporters behind BuzzFeedNews’ latest so-called bombshell investigation – Jason Leopold- says he has seen documents, But then on CNN his colleague said they haven’t seen any of the evidence. So now two BuzzFeed reporters on the story have given two entirely separate accounts whether they have seen the physical evidence detailed in their own report. It makes it ok that thousands will just automatically believe the unconfirmed story is true. 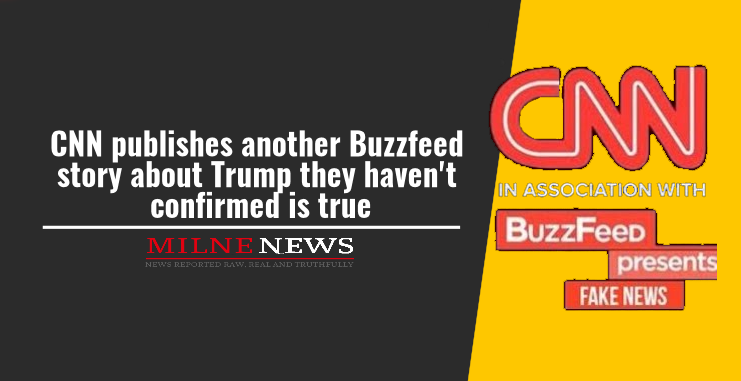 Well done CNN, you really are the king of spreading fake news and Buzzfeed is your queen. And how do CNN get away with it? By saying “hey don’t blame us, we’re just reporting it”. How do Buzzfeed keep getting away with it? Well, they’re never held accountable so they think they can run any fairy-tale.